Extended (i.e., random coil like). The backbones of these proteins appears to be highly extended, similar to beta sheets. That is, the backbones are stretched out (like a beta sheet's backbone as compared to an alpha-helix's backbone). However, these DRs lack long range contacts which are present in beta sheets. Therefore, the backbone angles fluctuate rapidly, unlike beta sheets. Collapsed (i.e., molten globule like). These DRs include, but are not limited to, molten globular regions. In general, molten globules have some proportion of secondary structure, but do not have stable tertiary structure. In comparison, collapsed DRs are more general than this, in that secondary structure is not required. Calcineurin is an example of extended disorder. It is a calcium- and calmodulin-dependent protein serine/threonine phosphatase. It is necessary for several important processes, including T-cell activation. It is composed of two subunits (colored yellow and blue in the image). It has several DRs, including one long stretch of 95 residues (colored red). In that region is the calmodulin binding helix (the red helix), a region of "potential" order. In order for calcineurin to become active, a second protein, calmodulin, must bind to calcineurin. The calmodulin binding site is the stretch of amino acids which form the helix shown above. The DR surrounding (and including) the binding helix allows calmodulin to access that stretch of amino acids and bind to it, wrapping around the helix (see below). It is at this point that the calcineurin disordered region undergoes a disorder-to-order transition. For a further discussion, please see Romero et al., 1997. Calmodulin (blue) bound to the helix of calcineurin (yellow). Clusterin is an example of collapsed disorder. It is a protein that was first found in secretions from Sertoli cells (which "nurse" developing germ spells in the testes) and was later found in other tissues, especially the brain. It has been identified as playing a role in apoptosis, cellular injury and lipid transport (Bailey and Griswold, 1999). When clusterin was digested with trypsin, only a portion of the potential cut sites were actually digested. Of the observed cut sites, the large majority were within regions of predicted disorder. When clusterin was denatured, several other digestion sites appeared, all within predicted disordered regions. This is shown graphically, below. This list is not exhaustive and will expand as more functions are discovered for disordered regions. Though DRs lack a defined 3-D structure in isolation, many undergo disorder-to-order transitions upon binding to their protein or nucleic acid partners (Dunker et al. 2001, Dyson and Wright 2002). 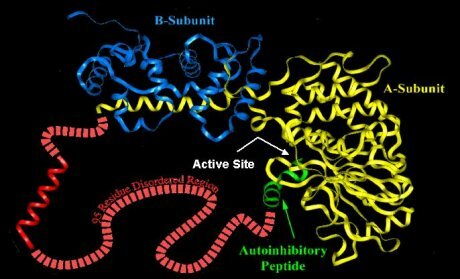 Given that amino acid sequence determines 3-D structure, the hypothesis was proposed that sequence would determine lack of structure as well. If local sequence indeed codes for lack of 3-D structure, disordered regions are distinct from structural elements that have been removed from their folding context. To test this, we developed a series of neural network predictors (NNPs) that use primary structure to make local predictions of disorder. In fact, from the high prediction accuracy achieved, we conclude amino acid sequence does code for DRs. Eight of these Predictors of Natural Disordered Regions (PONDRs) have been developed so far, but PONDR® VL-XT is the most mature of these. Bailey R and Griswold MD. (1999) Clusterin int he male reproductive system: localization and possible function, Mol. Cell Endocrinol., 151, 17-23. Dunker AK, Brown CJ, Lawson JD, Iakoucheva LM, and Obradovic Z. (2002) Intrinsic disorder and protein function, Biochemistry, 41, 6573-6582. Dyson HJ and Wright PE. (2002) Coupling of folding and binding for unstructured proteins, Curr. Opin. Struct. Biol., 12, 54-60. Romero P, Obradovic Z, and Dunker AK. (1997) Sequence data analysis for long disordered regions prediction in the calcineurin family, Genome Informatics, 8, 110-124.